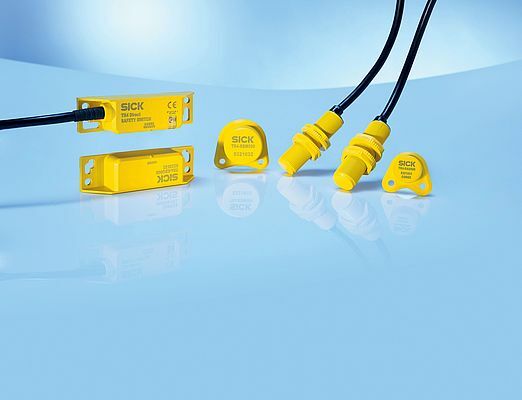 With the new TR4 Direct product family, Sick extends the range of non-contact transponder safety switches. Compact design, cascadability, as well as protection against tampering are their special features. The safety switches fulfill performance level PL e in accordance with EN ISO 13849 as well as safety integrity level SIL3 in accordance with IEC 61508 - doing so even if in a machine up to 30 devices are connected in series to one safety controller in order to save inputs. Each of the devices features two OSSD safety outputs, thus permitting simple and direct connection to a safety controller. Overall, ten variants are available in cylindrical and rectangular design with different actuators and features. In this way, they open up diverse options for safety-relevant, non-contact protection, among others of safety doors and removable guards. The response range of up to 25 mm permits high tolerances for door misalignments, thus avoiding shutdowns due to incorrect alignment as well as vibrations, and guaranteeing in this way trouble-free, high machine availability.